Today's Google reader yielded up a lot of food for thought from the DOC. The first was Holly's post over at Arnold and Me about her changing basal rates as autumn kicks in. I've been seeing a running theme on Twitter about basal increases the past couple weeks, and so it's already been kicking around my head. I'm not having the same issue (at least not yet), but I find myself completely intrigued by the idea. What could possibly cause such a thing?! Logically - and we all know the D has very little to do with logic - you'd think the cooler weather would be better for insulin efficacy, site adhesion, and all the rest of that. Seems it isn't so, though. Could it be a slight change in diet (more cooked foods, less cold salads and whatnot)? Being a tiny bit more sedentary (warm blankets and the couch instead of being outside)? Or do our bodies actually do a change in hormones for the season/change in light? Like I said, I can't stop wondering. It's like poking at a loose tooth. The second interesting post, for me at least, was at Diabetesmine: Beyond Fingersticks: Airing CGM’s Dirty Little Secrets. The brief book review was great, but it was the "CGM as the Third Revolution in diabetes management" (after insulin and home glucose monitoring) that really stuck with me. I know that my Dexcom has completely and totally changed the way I approach my diabetes management. I've been doing this for 16 years, have seen countless CDEs and endocrinologists, read all the literature, filled out endless logbooks, counted carbs, injected/bolused insulin, grappled with the aftereffects of high and low blood sugars, and even found small bleeds in my eyes - and nothing in all of that has made me more hyperaware of what living with this disease looks like minute by minute. 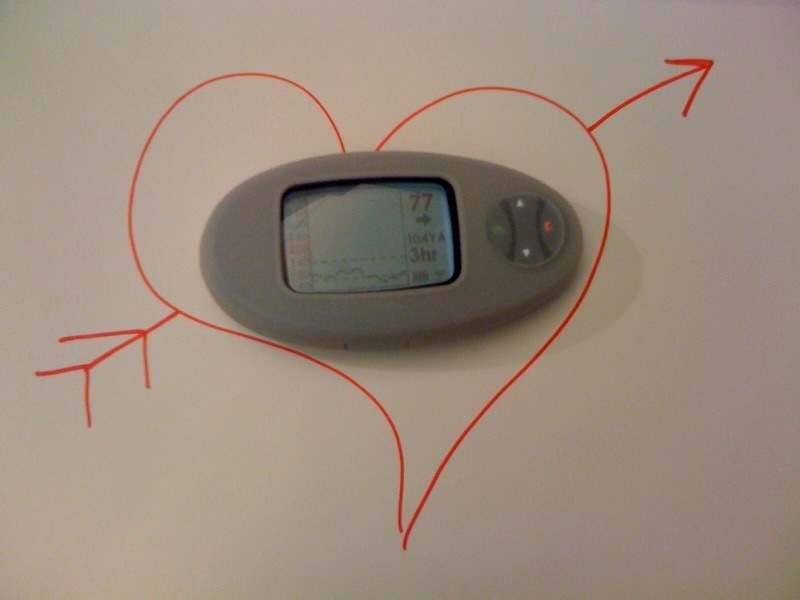 When I'm not hooked up to a sensor, it's easy to ignore my diabetes - if only for 5 minutes. I can watch a TV show, take a shower, sleep, whatever and not give more than a passing I should do a blood sugar soon thought. But now that I use Dex, I have learned a great deal about how much I was "cheating" the rules and have adjusted a lot of the ways I take care of myself. Is it weird to want to hug electronic equipment? For the first time, I'm actually doing my insulin 15-30 minutes before eating so that I can avoid that giant Dex mountain I discovered back in February. For years I've been told to do this, but a thrice-daily "Holy CRAP, look at that postprandial hump!" does wonders to underscore the fact that the doctors were actually right. I've become more careful about the foods I eat, since I now see how they move my blood sugar, both in speed of rise and change of number. Pizza has always been a MEF, but I'm finding a lot of foods who are secretly in that enemy camp and require devious strategizing to defeat. I feel safer going about my day knowing that I have the secret insider's scoop about which way my blood sugar is heading. I'm much more cognizant of how my body is a finely-tuned machine (all those teeny tiny basal changes! ), and that's engendered a bit more respect for it than I've had since 1993. This is no small feat. I, like so many in the DOC, have struggled - and will struggle - with food and a sense of deep betrayal. That I feel anything but anger or disappointment or any of the hundreds of bad feelings I've always had about my body and health is an immense shift. I'm not all the way there, but these are baby steps toward a better disposition and I think my regimen changes have a lot to do with it. CGM has absolutely been my own Third Revolution, after Humalog/Lantus (eat me, NPH!) and the pump. For me, Dexcom is a complete game-changer, welcome eye-opener, and wonderful-if-annoying prod for accountability. I feel naked without it and rely on it to the point of near obsessiveness. Most amazing of all, though, it gives me hope for what advances might be next and the desire to be as healthy as possible for when they arrive.